A Disgruntled Republican in Nashville: January is “Poverty in America Awareness Month,” How to be poor. January is “Poverty in America Awareness Month,” How to be poor. National Blood Donor Month, National Braille Literacy Month, National Hobby Month, Hot Tea Month, National Oatmeal Month and National Soup Month (link). I am addressing Poverty Awareness Month. I don't know who proclaimed it as such. I don't recall reading of any legislative action or Presidential proclamation making it such, but will accept that it is. 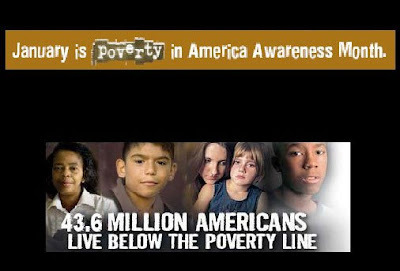 I have seen references to this being poverty awareness month from a couple different sources. The month is almost over and I almost missed formal recognition of the occasion. There are some people who are born with handicaps and disadvantages and must struggle to overcome their disadvantages, but for most people they have to do really stupid things to stay poor. It is hard to stay poor in America. After eight years of Obama it is easier to stay poor, but it is still hard. I am concerned about the future, however. While some of Trump's deregulation and tax reform will produce job growth and opportunities to make it easier for people to climb out of poverty, his determination to start a trade war may lead to a downturn in the economy and reduce opportunities for climbing out of poverty. His proposals for massive public infrastructure could give a temporary employment boost but if it adds to the already $20 trillion national debt, then it could lead to more poverty. With Trump's election, the steam will go out of the movement for a national $15 opportunity-destroying minimum wage, so that is good for poor people. So, while policies change and there is reason for concern, that is no excuse for staying poor. Having worked with poor people most of my life, I have observed some of the things that people do to achieve poverty. Here is a list. If you want to be poor, these are some of the things you can do. Become a single mom. This is almost guaranteed to make you poor. A single mother with one child earning $22,000 year is poor. A father, mother and child with a family income of $44,000 are not so poor. Have children early. Have your children before you finish school or before you are established in a career. Father children and don’t marry the mother. If you do this then you will have child support payments. If you are determined to avoid child support, you can work in the underground economy and constantly change jobs. This will help keep you poor. Enroll in college, take out lots of student loans, but don’t graduate. This way, you will have big loans to repay, but won’t have the benefit of the earning power of a college graduate. Become a criminal. Most criminals are poor. Once you become a criminal it will be very difficult to ever get a good job. Become a drug addict or an alcoholic. Take this job and shove it. If your boss is unappreciative, a customer is rude, or you get tired of working the third shift, just walk off the job. It is important to do this without having another job lined up and don’t give a two-weeks notice. Become satisfied in your dead-end job, stop looking for new opportunities, stop leaning new skills, and stop growing. Smoke cigarettes, drink beer, smoke dope and play the lottery. If you do this in moderation, it may not make you poor. You may need to do a lot of it. Don’t learn delayed gratification. Live for today. You want it, you deserve it, get it now. If you are short of money, use payday lenders. With a payday lender you can borrow $200 and on payday pay back $230. If you don’t have the $230, you can pay $30 and borrow the money for two more weeks, this is only 780% interest. Worrying about the interest rate is something middle class and rich people do. Don’t take advantage of your employer’s matched retirement plan. If your employer will match up to 3% of your income in a retirement saving plan, don’t fall for it. If he matches your 3% that is a 100% return, and since that is money you do not pay taxes on, that is another 25% return, and if your money and your employers money earns 5% that is a 10% return for you for a total of 135% return. If you do this you will find you are becoming middle class. Don’t put money in an IRA every year. If you do, that is money you won’t get to pay taxes on. Anyway tell yourself you need it now. You can’t afford to save. Use the Rent-a-center. If you need a washer and dryer, don’t buy a reconditioned used set for $150; pay $25 a week to rent a new set from the rent-a-center. Also, you can rent nice furniture and a TV and VCR and stereo. When you do your taxes, get a “rapid refund”. Sure you have waited all year for your money, but you look forward to your refund. Why wait another two weeks when you can have it now? If your refund is $2000 and if cost you $100 to get the rapid refund, since you are only borrowing the money for two weeks that is a 130% interest rate. Don’t worry about the interest rate and don’t wait two more weeks for your money. That is the way middle class and rich people think. You want it now; get it. Buy a new car. Did you know that most millionaires have never bought a new car? A new car is a rapidly depreciating asset, but a new car smells so good. You deserve it. It will make you happy. Do it! Always rent; never buy a home. A home is an appreciating asset and the biggest wealth builder for most people. Value your government handout. Don’t earn too much money or you may lose your section 8 or public housing, food stamps, and Medicaid. Think like a poor person. Be envious and jealous of people who have more than you do. Keep telling your self that life is unfair and that if other people did not have so much you would have more. Don’t "act white," or “get above your raising.” If you are black, don’t let yourself ever be accused of “acting white”. Don’t let anyone ever accuse you of acting like you are better than they are. Have lots of poor friends. They will make sure you do the things and have the attitudes that keep you poor.